Merge is a Transact SQL statement that enables us to perform insert, update and delete in one statement. Why use merge instead of SSIS? No, we still use merge in SSIS for ETL (rather than stored procedures), for code maintainability and ability to reach various platforms. Some projects use SPs for ETL (after landing the data to the DW SQL Server) because they believe it’s faster. But that is for another blog post. The question should be why using merge in SSIS instead of SCD2 or LookUp + OLEDB? dim2 is a dimension table with 3 columns: dimkey2, attr1, attr2, containing 1000 rows. In this example we want to update dim2 to reflect changes (update, insert, delete) in the source table which is a master data table. 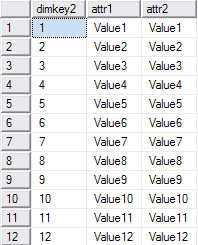 First we create the master data table, by copying from dim2 and modifying it. If you need to put contraints (literals) on the join condition, put the merge in a stored proc so the literals are parameterised. Or specify ‘parameterization forced’ query hint.